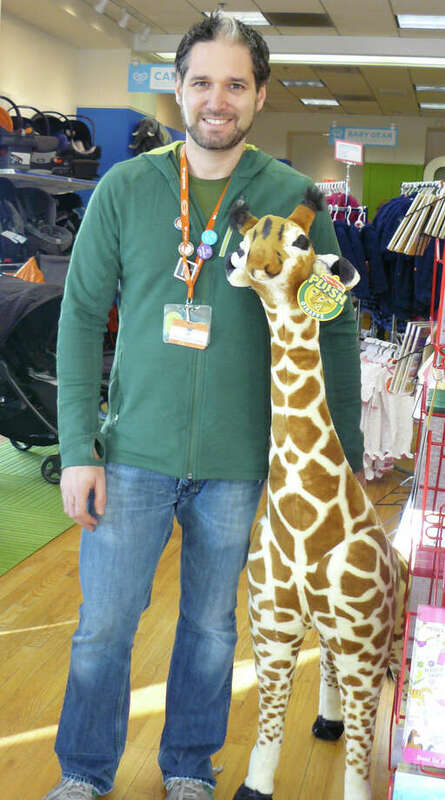 Eli Gurock poses with a friendly stuffed giraffe in his new store, Magic Beans. Gurock and his wife, Sheri, own five Magic Beans stores. The other four are in the Boston area. Eli Gurock, the owner of four Magic Beans baby and toy specialty stores in the Boston area, searched throughout New England for the location of his next store. "We discovered Fairfield," Gurock said as he recently helped unpack boxes to set up his new store at 1530 Post Road, corner of Miller Street. "Fairfield is an untapped gem." Gurock's research revealed that there are few stores in Fairfield County that sell baby equipment and specialty toys. And with all the families Gurock sees around Fairfield, "it seemed like a perfect fit," he said. Magic Beans opened its Fairfield store on Dec. 15. Gurock and his wife Sheri, started the business 10 years ago and specialize in baby gear, especially strollers and all kinds of toys for all ages. Their toys range from action figures to organic toys, and from dolls to scooters. The only requirement for the toys they sell, he added, is that they have to be fun. He and his wife are the parents of three children, ages 5, 9 and 11, and have been through the stages of baby and child rearing themselves. The couple met when they were young children -- only 4 years old -- and have been through all their schooling together, and now the development of their business, he added. The other four Magic Beans stores in Massachusetts are very much a part of their communities in Brookline, Cambridge, Wellesley and downtown Boston, according to Gurock. He plans for his Fairfield store to be the same. "We want the Fairfield store to be a community center," Gurock said. "Our full intention is to make that commitment to this area." Magic Beans, 1530 Post Road, is open 10 a.m. to 7 p.m. Monday through Saturday, and 11 a.m. to 6 p.m. Sunday. Visit the store's website -- www.mbeans.com -- for more information.